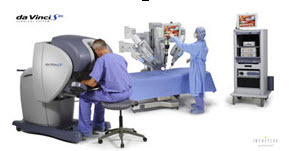 The da Vinci® Surgical System provides surgeons with an alternative to traditional open surgery and laparoscopy, putting a surgeon's hands at the controls of a state-of-the-art robotic platform. The da Vinci system has been used for a variety of minimally invasive procedures, including treatment for gynecologic and prostate conditions. It enables surgeons to perform complex and delicate procedures through very small incisions. Surgeons use the da Vinci system to make tiny, 1-2 cm incisions and operate with incredible precision and control. Prostate conditions that can be treated include prostate cancer, ureteropelvic junction obstruction, bladder and kidney cancer and vesicoureteral reflux. The system minimizes the pain and risk associated with large incisions. It also increases the likelihood of a fast recovery and has excellent clinical outcomes. For more information about the da Vinci system, visit the Division of Minimally Invasive Surgery led by Peter Geis, M.D.